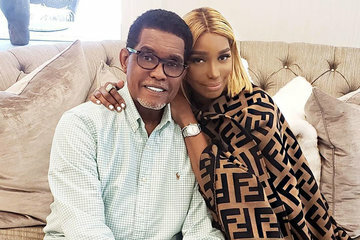 iRealHousewives | The 411 On American + International Real Housewives: NeNe Leakes Slams Husband Gregg Leakes For Being “Mean, Grouchy And Evil” Amid His Cancer Battle! NeNe Leakes Slams Husband Gregg Leakes For Being “Mean, Grouchy And Evil” Amid His Cancer Battle! In a since-deleted comment captured by The Shade Room, Real Housewives of Atlanta star NeNe Leakes lashed out on her husband Gregg, who is battling stage three colon cancer, and seemingly accused him of not following his own advice. Gregg, shared an inspirational message on social media. According to E! News, the post preached a number of important life lessons, including love those who practice kindness, forgive quickly and always think before acting out in anger. "Well u need to do everything you posted! Practice what you preach," she replied, later adding the following: "You need to pray for yourself! This mean, grouchy, evil stuff u pulling these days are NOT cool." After a follower called her a "cool piece of work" and noted the "tables can easily turn," NeNe clapped back. "Chileeee shut up!" she wrote in response. "Gregg has done so much s--t. It didn't just start! While u commenting saying s--t to me, ask him what has he done! Oh, and by the way, Gregg isn't bed stricken and needing daily help! You got it twisted." She also fired back at another follower after the social media user called her "so evil" and told her to "go to hell" in the comments section of another post. "You don't know S--T about Gregg and NeNe Leakes and you have no idea what he has done!" she replied. "Ask him [a--hole]." In addition, she took to Twitter to express her frustrations. "I would just think if I have or had cancer, I would see life so differently!" she wrote. "Not being mean, grouchy and evil for no real reason! But that's me. Pray for me." After another follower encouraged her to "stay strong" and "just breathe," NeNe replied, "Naw don't think I can do it." "I'm ALWAYS the bad guy," she later added, "so I'll take that. If you only knew." NeNe revealed her husband's cancer battle in June and confirmed it was colon cancer during her show's season 11 premiere earlier this month. "The day that Gregg told us Gregg has cancer, my life changed in that moment," she said on a recent episode of Watch What Happens Live With Andy Cohen, according to E! News. "You know, being a caretake is very hard. It's just been very difficult. I feel like that day I lost my husband—because he's not with me; we don't do the things that we normally do together. It changed our life. We're not even in the same bedroom."